Spaghetti Squash tends to be an ingredient that unfortunately finds itself synonymous with recipes that fall flat on the flavor, as it is used as a low carb alternative to many pasta heavy dishes. 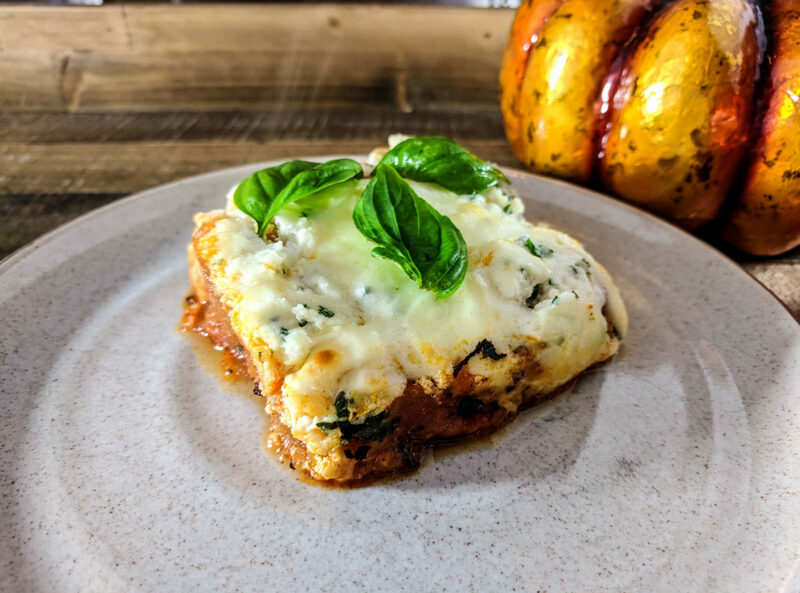 Fortunately this recipe hits the spot in terms of flavor, and is a great alternative to your traditional lasagna that can be heavy and overindulgent. This spaghetti squash lasagna has a secret umami bomb right before it goes in the oven, leaving one feeling satiated and satisfied. Preheat the oven to 400 degrees F. Cut the spaghetti squash in half, remove and discard the membrane and seeds. Sprinkle liberally with salt and pepper and place flesh side down on a baking sheet. Cook the squash without moving for about an hour. Allow the squash to rest on the sheet for about 10 minutes or until cool enough to handle. Use a fork to remove the spaghetti like strands of squash from the halves and place into a paper towel lined colander to absorb any excess moisture while the sauce is prepared. While the squash is cooking in step #1, prepare the sauce for the dish. Remove the sausage from the casing and chop the onion and mince the garlic. Heat the olive oil in a sauce pan over medium until soft and translucent, about five minutes. Add the garlic for about a minute and saute until aromatic. Add the sausage and break it up with your spoon and cook until it is no longer pink. Add the tomatoes and once they have started bubbling, reduce the heat and simmer for 20-30 minutes. Taste the sauce for seasoning and add any additional spices it may need after the 20-30 minute mark. Stir in the fish sauce and chopped basil, and remove from the heat. Combine the ricotta cheese, parmesan cheese, and parsley in a small bowl and set aside. Place the spaghetti squash into a loaf pan and mix in about half of the sauce. Spoon the cheese mixture on top of the squash and then top with the shredded mozzarella cheese. Bake for 20-30 minutes, it will be done with the mozzarella cheese starts to brown in spots. Top with remaining sauce or reserve for another purpose.